On Tuesday, February 6, 2018 at approximately 5:34 pm, officers responded to Dillon’s grocery store, 2600 N. Broadway, for a report of a robbery. 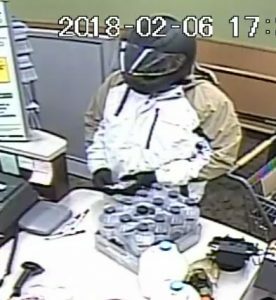 An individual wearing a black motorcycle helmet, a tan and white coat, dark slacks and dark gloves was observed in surveillance footage approaching the store from the south on foot, where he then entered the business. He used a grocery cart and filled it with various items before approaching the front customer service desk to check out. 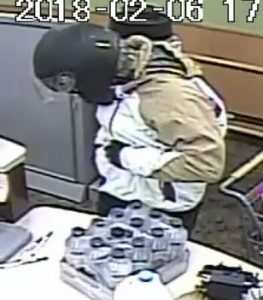 During checking out, he removed one of his gloves, reached into his pocket and gave the clerk a note demanding money. 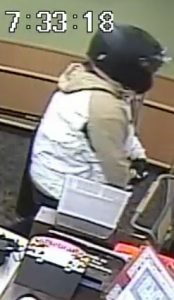 The suspect was given an undisclosed amount of US currency and he left the store southbound on foot. A weapon was not brandished. The suspect is described as a Caucasian male, approximately 6’00 tall, with an average build. The investigation into this incident is ongoing at this time. Anyone having information related to this incident, or other crimes, is urged to contact the Pittsburg Police Department at 620-231-1700, or at our tip line, 620-231-TIPS (8477). Callers may remain anonymous.